Cole and Barbie Blank stepped out as a couple for the first time at the 2019 ACM Awards! More here. 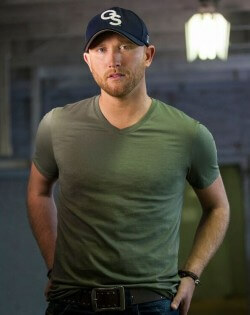 Cole Swindell has released his very own Peppermint Moonshine through Sugarlands Distilling. The country star is ready to sip up with his fans while they quite literally get their shine on. Cole’s new collaboration with the Tennessee based company follows the release of his third studio album, All Of It. Swindell’s peppermint-flavored moonshine is now on sale for $24.99 per jar in select stores and online.The singer-songwriter even shared several recipes to consider when drinking his very own signature craft including Southern Mint Tea, Peppermint Peach Tea, and more. Perhaps Swindell should bring a case or two out on the road wih him for his 2018 Reason To Drink…Another Tour. Click here to purchase Cole Swindell’s Peppermint Moonshine. Cole dropped by the MLB Network to talk about country music and his friendships with some of MLB’s biggest stars. Click HERE to watch the interview.